Last day for 10,000 Miles & More credit card miles! 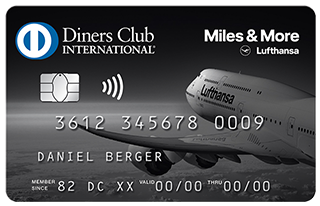 Of all the surprises that the miles and points industry threw up in 2018, I think Lufthansa launching a Diners Club charge card must be close to the top of the list. This card comes with 10,000 Miles & More miles as a sign-up bonus but ONLY until 31st December. It will drop to 5,000 miles in the New Year. Given that you need to pay a £79 fee to apply, you should be jumping on the higher bonus. You can find out more, and apply, here. I now have the card and so I have a better idea of how it works. The new Lufthansa credit card really is from Diners Club! And it isn’t a credit card. Yes, the card that time forgot is back. Unfortunately, just because the card is back, it doesn’t mean anyone is accepting it. Diners Club was the first ever ‘deferred payment’ card, I think, but I can’t remember the last time I saw one before this launched and I’ve certainly never had one until now. If you thought using American Express was tricky at times …..
What is the card called? Who is behind the card? The Miles & More Global Traveller cards are issued by Affiniture Cards Ltd which is Diners Club in disguise. However, the companion Mastercard card is issued on behalf of Affiniture by Cornercard UK Ltd. Cornercard is a Swiss bank which offers a Lufthansa-branded card in Switzerland. This complex structure is required because Affiniture / Diners Club does not have a licence to issue a Mastercard itself. What is the sign-up bonus? 10,000 Miles & More miles, until 31st December 2018. This credits with your first purchase – there is no spend target to hit. From 1st January it will drop to 5,000 Miles & More miles. What is the on-going earning rate? This is the interesting bit. You earn 1.25 miles per £1 spent. This is a VERY good rate for a Mastercard, even one with an annual fee. It isn’t as good as the market leading Virgin Flying Club Reward+ Mastercard (1.5 Virgin Atlantic miles per £1) but the fee is 50% lower. Is there a foreign exchange fee? There isn’t one. This is a charge card and NOT a credit card. You MUST repay your balance in full each month. You MUST pay by Direct Debit. There is no option for cheque payments or even manual online payments. What the heck does this bit of the T&C’s mean? What this means is that Diners Club will, in effect, load your pre-paid Mastercard a fraction of a second before the money is authorised for the payment. You don’t need to do anything out of the ordinary. The risk here is that you get a higher rate of declined transactions because each transaction must be authorised TWICE – once by Mastercard and then a split second later by Diners Club as it decides whether to load your pre-paid Mastercard or not. Can I get a supplementary card? No. They are not allowed. No idea why. Is there an app? Can I use it with Apple Pay? There is no app. You can use the Mastercard with Apple Pay / Android Pay, but not the Diners Club card. Any other problems I may face? You do not automatically get Section 75 protection if a retailer goes bust as this is not a credit card. I don’t know if Diners Club is voluntarily offering cover, as Amex does to charge card holders. The Mastercard, as a pre-paid card, may not work at places requiring preauthorisation, eg hotels and car rental outlets. Changing the PIN on the Mastercard is easy, as it can be done at any bank. Changing the PIN on the Diners Club card requires you to use a cash machine run by Cardtronics – there is a list here. If your local corner shop has an ATM, it is probably from Cardtronics. One other lesson I learnt the hard way – after you call to activate your Diners Club card, you need to wait until the next day before using it or changing the PIN. The Mastercard activates immediately when you call. Online activation is not possible. The good news is that Diners Club doesn’t try to sell you anything when you call to activate. One other point to note is that, for some reason, the Mastercard looks cheap. Your details are not embossed on the front, they are printed on – but in a font which makes it look like embossing! What other benefits do I get with my Miles & More Global Traveller Card? You can access a curated portfolio of airport lounges for £15 per visit. Does this credit card stop my Miles & More miles from expiring? Yes. Miles & More has a VERY aggressive expiry policy – your miles expire 36 months after you earn, irrespective of what activity you have. Is this card better than the Starwood Preferred Guest American Express for getting Lufthansa miles? Here is an important thing to remember: this card has the same earnings rate (1.25 Miles & More miles per £1) as you get indirectly via the Starwood Preferred Guest American Express card, which has a £75 fee. The only caveat is that you need to convert your Starwood / Marriott points in chunks of 60,000 (£20,000 of card spend) to get the 1.25 Miles & More miles per £1 rate. On the other hand, Starwood / Marriott points are MASSIVELY more flexible than Miles & More miles because there are another 40 airline partners plus of course hotel room redemption options. If you have Lufthansa status – and so don’t have a problem with miles expiry – the Starwood Amex may be a better option. You should sign up for the first year, of course, because you will get 10,000 miles for just £79. For the rest of us who are worried about our Miles & More miles expiring, we are stuck with this new Diners Club package. This is one of the oddest card packages to come along in a long time ….. perhaps ever! The bottom line is a simple one, however. 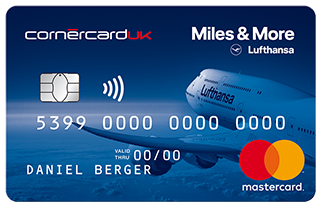 If you want to protect your Miles & More miles from the three-year hard expiry, and don’t have Miles & More status, you MUST get this card and use it once per month. Your miles are then protected. If you have Miles & More status you don’t need this card. It is worth getting it JUST for the sign-up bonus (£79 for 10,000 miles is a decent deal) but you can then happily cancel it and stick with the Starwood Amex as a more effective way of earning 1.25 Miles & More miles per £1, with the extra benefit of also being able to use your points for hotels or other airlines. Personally …. my Mastercard now sits in my office desk. Once a month I will buy my lunch on it. The Diners Club card is hidden away and unlikely to ever be used. The £79 fee I paid for Year 1 was worth it purely for the 10,000 miles sign-up bonus, so I have no problems with that. I am less keen to pay £79 per year going forward but that will depend on when we find a good opportunity to spend our existing 200,000 Miles & More miles. Given that it is never easy using Avios during school holidays for a family of four, having access to all of the 29 Star Alliance airlines via Miles & More is worth having. A family member has close to 50k miles expiring in 3 months. No point of getting the card I guess? It is misleading to suggest that Amex voluntarily provides Section 75 protection to charge card holders or that the above cards might offer it voluntarily. Section 75 of the Consumer Credit Act 1974 allows the card holder to claim against the card issuer for any breach of contract by the merchant, including all the costs of remedying that breach of contract. For example, if an airline goes bust just before you fly, then you can claim against the card issuer for the cost of replacement tickets on another airline, which could cost many times the original purchase price because it’s last minute. Any voluntary chargeback scheme is limited to the original transaction amount and does not extend to consequential losses or the cost of remedying a breach of contract. Diners Club was fantastic in the late 1990s. I had one issued in Germany for DEM 150 (EUR 76.69) per annum. The lounge access was widespread, and allowed entry at no additional charge. I could have up to 8 card holders on the same account, which meant I could give free lounge access to family etc. I kept it after moving back to the UK, but then Diners Club suddenly ended agreements with many lounges, leaving for example only one for all London airports (LHR T1 I believe), so I stopped the card at that point. When I try to pay by Amex, shop or restaurant staff often say rather stupidly “Amex is the only card we don’t take”, upon which I would present my Diners Club card instead, which proved them wrong. Diners is actually better than I’d expected. I’ve got one through Citibank Australia, and they don’t charge forex fees (3.4% on the Visa, waived on the DC). Acceptance in Australia is a bit of a pain, supermarkets and petrol stations are all good though. However, acceptance overseas is pretty good. The use other networks which has been great for me, Discover in North America, JCB in Japan and Unionpay in China (though it doesn’t work on UP outside China). > When I try to pay by Amex, shop or restaurant staff often say rather stupidly “Amex is the only card we don’t take”, upon which I would present my Diners Club card instead, which proved them wrong. I am SO going to use that!!! lol! Incredible awkward and difficult to read, navigate and use. £15 entry fee to lounges is good benefit, when flying economy without status. I may try it at LHR2 Premium Plaza. Since the Mastercard is technically a prepaid/debit card, does anyone know if it works at HMRC without incurring a fee? Curve is not an option due to the limits. Good question! I can try it next week – card is in my desk in the office (as the article says). Did you manage to test the MC at HMRC?